The proposed network will deliver more service, more often, to more places. We’ll offer frequent service within a half mile of 70 percent of the county’s population. With service that comes every 5 to 15 minutes or better all day, you’ll be able to just show up and go. We plan to add 20 new RapidRide lines and upgrade existing lines, connecting the county with 300 miles of new and upgraded RapidRide service. Metro will operate all-day, limited-stop express buses that arrive every 15 to 30 minutes or better throughout the day. 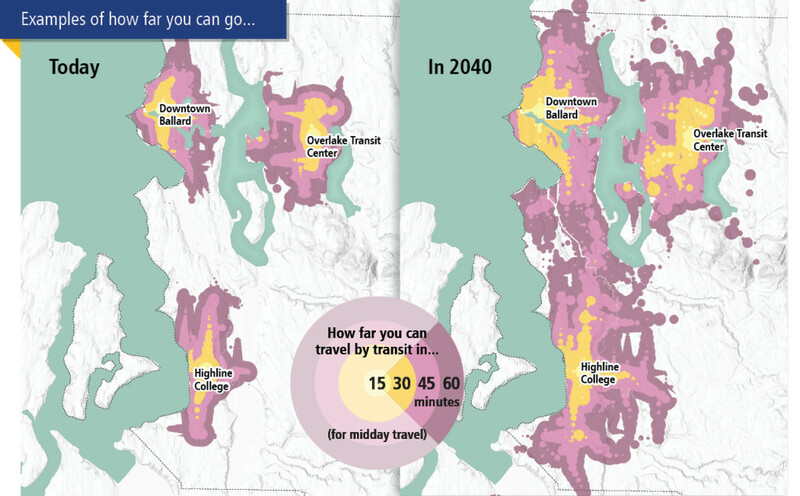 Express buses will connect centers where many people live and work across King County. “One size fits all” doesn’t work in our diverse county. Recognizing unique local needs, we’ll work with community members to put in place the right type of transit or alternative service. These services will allow users to get around locally, connect to the network, or travel the last mile home. The travel sheds shown above include walking time, average amount of time waiting for the bus (assumed to be half the frequency), travel time, and any transfer time between buses. 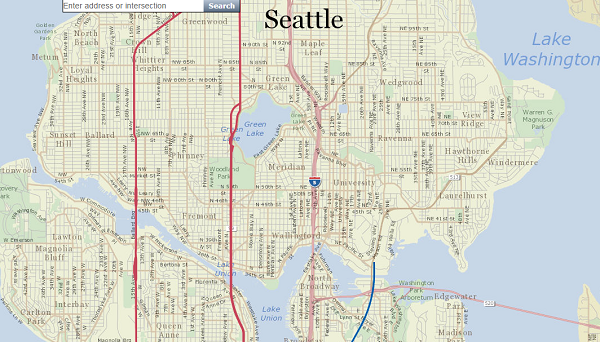 Highline College—S 240th St and Pacific Hwy S.
Unchanged routes retain existing route numbers. Four-digit route numbers are placeholders for future routes. 1000s are frequent routes (red); 2000s are express routes (green); 3000s are local routes (yellow). Transit alignments are approximate and do not represent final decisions. Sound Transit services represented here have been developed to assist the Sound Transit Board as it develops an ST3 system plan for voter consideration.